Starter Kit has everything you need to get going with I2C in 5 mins. Training Videos to help use and understand our products. 12 Bit Precision ADC module using MAX127 available. BothUSB and RS232 interfaces. USB for speed. RS232 for distance! Simple ASCII protocol is easy to use with any OS, and any programming language. Use as a simple parallel I/O port without any serial bus devices e.g. drive relays. Use I2C-2-PC for development. Redesign with BL233 for low cost later. 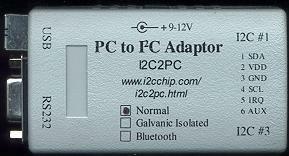 I2C Starter Kit is the fast, easy way to get up to speed with I2C and the I2C2PC adaptor. Just the Bare IC to build into your own OEM products. At $3.95 in small quantities, and less in volume, you can build profitable volume products around the BL233. Store POWER-ON, WATCHDOG-TIMEOUT and INTERRUPT macros internally: Runs even when the PC doesn't. Works with all Win,Linux, PDA's, Calculators. Simple ASCII commands: No API's, No DLL's needed. No hidden software costs. All our products use the small reliable Micro-match 6 pin connector. For your convenience we have connectors and built up cables available. Connector and Bus Pinout Learn about our pinout, and those of lots of others. Even if you don't use our adaptors, you can use our well thought out pinout and, compact connector for I2C and SPI bus devices. Our free Realterm software talks directly to the I2C-2-PC / BL233. You can just talk write and read directly from any new serial bus IC with no programming at all. Sip Modules: SIP modules as small, simple pcbs with a single row of I/O pins along one edge, and our standard I2C connector. The only pins you need to wire up, are the I/O pins you are using. Everything else is done for you. Because the pins are 0.1" spaced, they are easy to put on proto-boards of all kinds. You can even put standard 0.1" plugs on them. 4 digit Numeric Displays Numeric displays are unbeatable for readability! LED and LCD, 0.3", 0.56", 0.8", 1.0", 2.3", 4.0"
Hours Run Meter with IR output. Sensiron: Humidity and other sensors. 2 wire sensor are NOT i2c, and not addressable. I2C2PC and BL233 can read them See How. 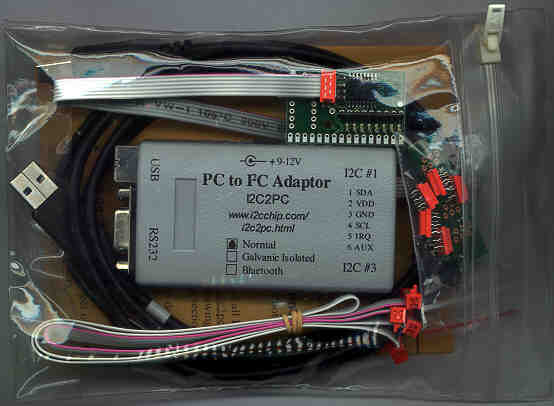 Bit Bash Serial and Parallel Adaptors: There are many described on the web. We don't include these because of the numerous limitations of this approach. 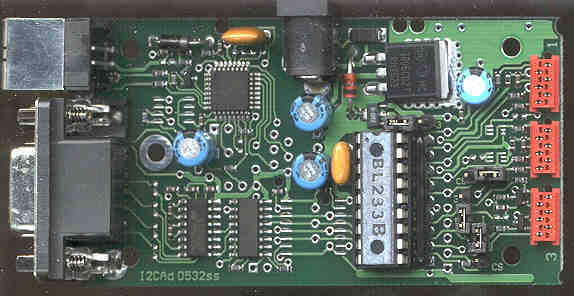 Our Bus Monitor board is an interface to Andy Greens Warmcat software, and comes with it on disk. Clarydon Electronic Services Limited provide PCB fabrication, Assembly and associated PCB Services including Multi layer (up to 24 layer), Double Sided and Single Sided PCBs. Last revised: Jan 31, 2012 .